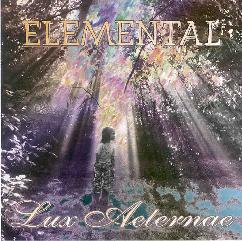 Elemental - "Lux Aeternae" / Elemental - "Thee Divine Imagination"
Elemental is the moniker used by Portland, Oregon electronic musician Steven Stokes, who has released two CD's to date. "Tzolkin" is the opening track on Lux Aeternae and introduces me to the Elemental experience, immediately bringing to mind memories of early exploratory Tangerine Dream. Syncopated synth patterns of varying pulses and volume lay the foundation for a space journey that includes speeding comet synth waves, rocket ships soaring from one channel to the next, and a variety of other electronic designs and textures. The music develops slowly but steadily, keeping me in analog heaven throughout. "Rexa-Caculha" is a 16 minute standout track that begins with a drifting atmosphere and percussive melody, but is a bit on the New Agey side. So just as I'm feeling slightly disappointed, all of a sudden we're back to Berlin when a fast-paced syncopated synth pattern kicks in accompanied by a parade of urban space sounds and atmospherics. Like a cosmic electronic roller coaster ride, the electronics bleep, gurgle, and pulsate, but additionally create a frantic measured tension. "Por Argento" starts off with a dark atmosphere that I enjoyed, and is also among the most cosmic space heard on the CD. But my excitement soon waned as it got a little New Agey half way through. "Le Charme" stood out as a simple track, but one that really grabbed me. A slow plodding melody line is accompanied by an angelic choir and intermittent waves of space synths. "Sacred Site" and "Lapis Philosophorum" are similar, but at 12 minutes, the later has much more room to stretch out and develop. Very nice. 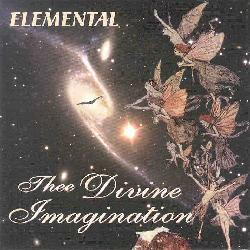 Thee Divine Imagination is another fine set with impressive space electronics, though it was also heavier on the symphonics and Vangelis New Agey styled music. The title track and "Faerie Magick" are examples. "Un Danse Petite" sounds like it would fit on an Enya album. "18K" picks up the adventurous pace, including beautiful symphonics with plenty of freaky space fun to keep things both heavenly and strange. "Solis Artus" is an orchestral piece with an off-kilter synth pattern that gives the music an experimental edge. "Spiritus Lenitatis" plays an Oriental themed synth melody and heavenly cosmic atmospherics that I liked. Among my favorite tracks was "The Solar Disc" with its dark droning symphonic space electronics embellished by freakiness galore. One of the stronger tracks on the album. "Kozmotron" features rapid melodic percussive runs mixed with symphonic walls of sound embellished by wild synth textures. On "Illumination" a mechanical synth melody, orchestral keyboards, heavenly atmospherics, and a droning industrial mood allow this meandering tune to be perceived as coherent and whole. And I think my overall favorite track is "Aethyria". Heavy throbbing drones weave a slowly twisting linear path accompanied by only slightly faster waves of space sounds. The atmosphere has a dark and eerie feel that added some welcome variety to the set. Stokes does an excellent job of creating what seems like a simple landscape, but it actually contains many varied layers. In summary, Steven Stokes/Elemental creates music that recalls those thrilling days of Berlin school space electronics, but shakes off the retro tag by including music with a more composed orchestral feel. The New Age elements sound a bit "fluffy" on Lux Aeternae, but that may be because they contrast more with the old-time Tangerine Dreamy styled electronics. Stokes combines the these elements more comfortably on Thee Divine Imagination. Freaky space and heavenly New Age coexist comfortably making the music both meditative and adventurous. For more information you can visit the Elemental web site at: http://www.spiritone.com/~revfever/. Contact via snail mail c/o Aethyr Productions; PO Box 2171; Portland, OR 97208-2171.